An important new book on the unseen world by Tom Julien has now arrived in the BMH Books warehouse and is available for shipping. The book purports that throughout history, three princes have exercised authority over the earth. 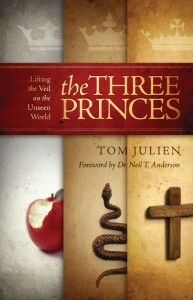 The three princes—Adam, Satan, and Jesus Christ—are discussed in detail in The Three Princes: Lifting the Veil on the Unseen World by missionary statesman Tom Julien. The book will be featured on Saturday, July 23 at the BMH corporation meeting in Wooster, Ohio, and author Julien will be speaking that night about the book and will be available for autographs. Skillfully combining scriptural teaching with his own experience as a cross-cultural missionary leader, Julien portrays the short rule of the first prince, Adam, and then graphically unfolds how Satan, as the second prince, stole Adam’s authority but ultimately is defeated through the triumph of the third prince, Jesus Christ, who became a man in order to win back what the first man had lost. The author, Tom Julien, is a graduate of Bob Jones University and Grace Theological Seminary. With his late wife, Doris, he served as a missionary in France for 28 years, during which time the Juliens began the ministry of Chateau of Saint Albain, which has become a center for evangelism, training, and church planting. From 1986-2000 Julien was Executive Director of Grace Brethren International Missions in Winona Lake, Indiana. He is currently involved in leadership training, including serving on the staff of his local church. He is the author of a number of books, including the highly-acclaimed missions book, Antioch Revisited, also published by BMH Books. 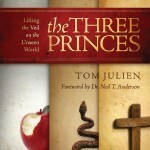 The Three Princes is a 190-page paperback, and retails for $16.99 wherever Christian books are sold in stores or online. The ISBN number is 978-088469-278-2. For more information log onto bmhbooks.com or call (toll-free) 1-800-348-2756. I would enjoy to receive the Tom Julien's new book IN FRENCH ... Could you tell me when it will be translated ? Thank you very much The picture on the book is sensationnal !